Shop from now until May 21, 2016 at any Michaels store location in the United States and get 30% off all regula price purchases! 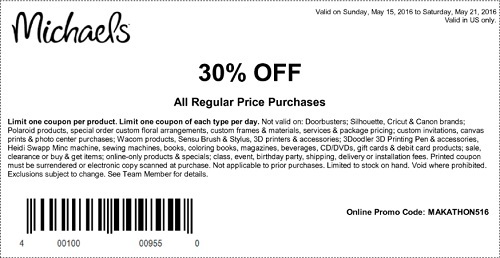 It is very easy to get the offer, just print the coupon, visit your nearest U.S. Michaels store location and get the offer. You can get your coupon at Michaels online. Source of the information is Michaels. Offer expires May 21, 2016. More details about the sale available at U.S. Michaels store locations.